Nava Dunkelman is a Bay Area based percussionist and improviser. Born in Tokyo, Japan and raised in a multi-cultural environment by an American father and Indonesian mother, her musical interests span the globe from Indonesian gamelan to American marching band, from classical to contemporary to the avant-garde. She is a member of electro-percussion experimental noise duo IMA with Amma Ateria and improvisational duo DunkelpeK with Jakob Pek. Nava enjoys discovering her own musical language by exploring experimental approaches to communication, progression and space. 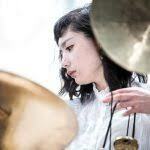 Amma Ateria is an electro-acoustic composer, improviser + sound artist born in Hong Kong, based in California. Her practice in sound exposes her body’s visceral resonance in polar opposites, examining the boundaries and brinks of breakage in the sonic spectrum via saturated transitions of stark polarities. With memories of condensed cities, she gravitates to sounds of close-ranged airplanes, inaudible conversations, out of body experiences, sustained harmonics intersected with musique concrète, and distorted speech/lost voice as melodic element. Since her studies at Mills College in music composition, audio engineering, and media technology, her work has been presented in installation and performance as artist-in-residence at SoART Millstättersee, Austria in 2013, Titanik Gallery, Finland in 2014, The Stone, New York in 2016, and BAMPFA, California in 2017.